Look what landed on my doorstep today! Thought I'd put this here since its a tube amp. Found this on Reverb for a good price. It sounds great considering the speaker cone is a little soft. Farts a bit on low notes. Speaker looks original, as do the tubes. The 6X4 rectifier is a JAN Phillips, not sure if that would be original. Is that really how they hooked up the speaker back then? Right off the O/T winding? Fear leads to Anger, Anger leads to Hate, Hate leads to Suffering. Last time I checked, site name said "SS"
Ummm, yes this is the area of the forum for tube amps. I guess this forum doesn't get much traffic from tube amp folks. Oh well, mods please feel free to move this thread as you see fit. I guess it would have been better in players corner. Speaker load is the secondary side circuit so how else should they make the connection? Since I see no features such as extension speaker jacks or alike isn't that the shortest and most logical method to connect the speaker? Theoretically there could be a speaker out jack and a plug in the speaker wires ...but why? Now its solid connection to load and additionally they manmaged to make the cheapie model even cheaper. IMO, this one isn't even an oddity. You probably haven't seen those vintage amps yet that have their tiny, tiny OTs riveted right to the speaker frames...? teemu, I could be wrong, but I think what he found odd was the enamel winding wires from the transformer soldered directly to the speaker. As opposed to the winding wires going to a terminal strip and then the speaker wires connected there. So the physical arrangement rather than the electrical aspect. At least that is how I read it. Actually, on old amps like that, it was not uncommon to see the small output transformer itself mounted right on the speaker frame. Then the (typically) blue and red wires of the primary went back to the chassis. Hey chaps,,, if you go back far enough, before magnet materials became economical speakers had a big Electromagnet wrapped around the voice coil of the speaker. IIRC simply called Electromagnetic speakers which came with a Field Coil which created the magnetic field for the VC. Yes, this is what I meant, the physical arrangement I had not seen before. It makes sense to do that in a budget guitar amp where they are pinching pennys. The question was sort of rhetorical. Sorry, I should ask questions where I actually expect an answer, rather than "thinking out loud". well... familiar in the sense that I had on old "portable" record player (my Dads) long ago that I took apart to "see how it worked". It had field coil speakers. I stripped it down to attempt to build a rather crude guitar amp. My Dad didn't mind, he had bought a fancy "new" stereo music system. I knew enough to know that the guitar input would have to be hooked up where the needle cartridge was connected. I doubt field coils were wired "out of phase" because they ran on DC.. If you have two coils wired one reverse the other, they form opposing magnetic fields, a weak result. In my example, the field coil is a separate issue from the speaker frame mounted transformer. 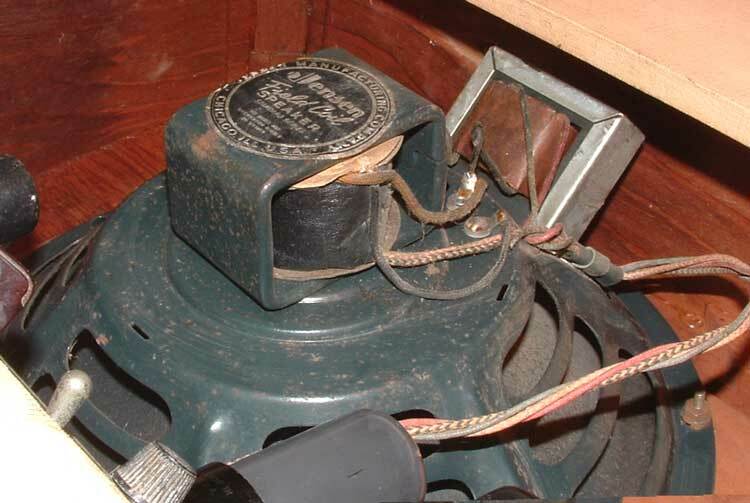 Though not hum-bucking, the field coil does often also serve as a choke for the power supply. So it is dual purpose in that sense. However, I do vaguely recall some speakers that did in fact have an extra hum-bucking coil? You are correct, this is where this post belongs - no worries! So I installed a 3 wire power cord and clipped the death cap. The amp no longer works! Quick inspection reveals the O/T primary is now open! Rats! Seems this is common on these amps (google search) so I ordered a Hammond replacement O/T for a Fender Champ. Mercury Magnetics has a Silvertone 1481 O/T listed, but the price is triple the Hammond.